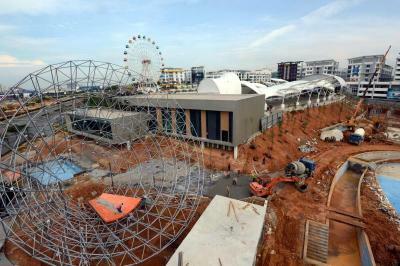 Nearly ready: Work on the WaterWorld @i-City is 70% to 80% complete. Malaysians can look forward to a zero-gravity experience on The Tornado Ride at i-City’s fourth leisure component, WaterWorld @i-City soon. i-City’s developer, I-Berhad, unveiled the park’s latest attraction recently. The Tornado Ride is 70% to 80% completed and the 4.05ha (10-acre) theme park is scheduled to be opened to the public this November. I-Berhad director Monica Ong said WaterWorld @i-City was the fourth leisure component in i-City after the completion of the popular digital lightscape, outdoor park rides as well as the Snowalk. “The theme park will also provide visitors, especially families, a wholesome experience,” she said. “The Tornado will be the flagship ride of the theme park and it will offer visitors an exhilarating ‘weightless’ experience,” she said. The first Tornado was introduced in Canada in 2003. To-date, there are more than 100 Tornado rides in the world and WaterWorld will be the first in the Asean region to feature such a ride. The Tornado is a 28-second thrill ride where riders in groups of four will be sliding down on a tube raft through a steep 160-foot water tunnel. The tunnel is connected to a seven-storey high funnel inclined at 45 degrees. Riders will experience four to six oscillations in the funnel with a 60-foot diameter opening that reduces gradually to a 10-foot diameter at the bottom before splashing onto the 1,350 sq ft landing pool. It is at the peak of each oscillation that riders can feel the zero-gravity effect. The funnel and tunnel are made of fibre glass and the ride can take an average of 480 riders per hour. Around 16,000 litres of water are pumped into the funnel to reduce friction between the raft and the funnel. Visitors can also check out the gigantic wave pool with a stage and LCD screen for concerts and special events. There is also a river adventure through the Rockery Cave that is illuminated by LED lights. Children can indulge in the Rainbow slide and enjoy a splashdown at the Children Adventure pool. Ong said the company had invested RM25mil in the whole project and expected to break even in two to three years. i-City currently attracts 90,000 visitors weekly and expected a 30% increase in the number of visitors once the project is completed.